An utterly enthralling yet inevitable 337-run defeat for South Africa at the hands of the India unfolded at the Feroz Shah Kotla on Monday, giving the hosts a 3-0 series win and the Proteas a serious dignity dent. For 143.1 overs, South Africa dug a trench that was at times untouchable as they chased down India’s venerable and eventually unreachable target of 481 on a pitch that turned a mile on day five. At 2/72 starting on day five, 409 runs seemed an ask even for a line-up as strong as the Proteas after a spate of low scores. Yet there was every chance with 90 overs remaining in the day. Hashim Amla and AB de Villiers together scored 68 of the Proteas’ 143 final innings runs – off a staggering 633 balls. It was aptly named “Blockathon”. It was the dismissal of Amla that triggered the downward spiral – South Africa lost their last seven wickets for 67 and were never able to recover. Who can forget Umesh Yadav angling the seam inwards to Kyle Abbott and shattering leg stump from a ball that never looked like missing. The game was well and truly over before that stage, but the firey quick provided a highlight on a pitch where spinners ruled. On a Delhi pitch specifically curated to break up and allow the spinners to rip out of the rough, South Africa’s effort is commendable – but against the rest of the tour, doesn’t smother any of the cracks exposed. The results were progressively worse and worse for the visitors, save the downpour in Bangalore that saw the second test declared a draw. In Mohali, the margin was 108 runs; in Nagpur, 124 runs before the mammoth victory in Delhi. De Villiers scored 258 runs at an average of just under 37; the next best was Dean Elgar with 137. In comparison, India had four of the top five scorers and the only century maker, Ajinkya Rahane. If one were to look at just the innings scores, the games were highly competitive, but the Proteas fell down with the bat at almost every turn. 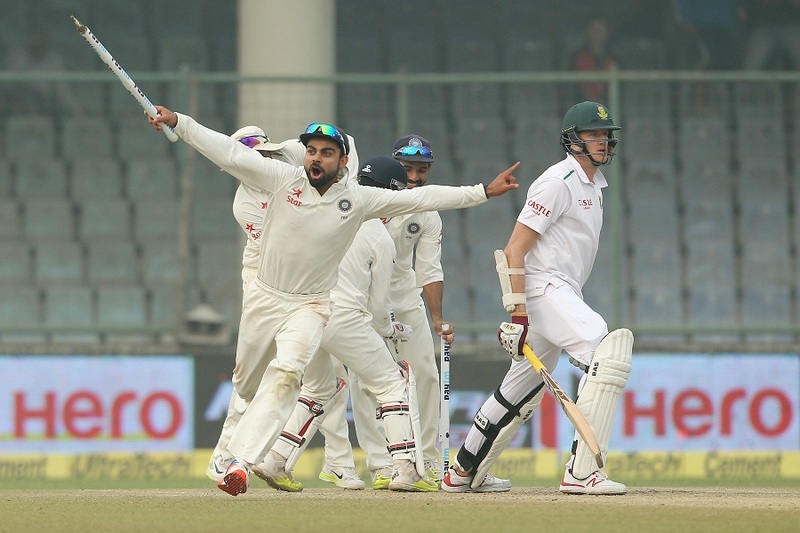 Sitting atop the ICC rankings table as the world number one test team, South Africa was dismantled by India with a highest team score of 214 in the washed out test; India hit or passed the mark five times. Akin to a change in the wind, South Africa’s mettle was tested in every innings. De Villiers, forever the routine specialist who rolls out a 100 in 70 balls, faced 298 in Delhi just to try and see his side to the draw. From the start of this test, after India’s 334 and Rahane’s sterling 127, South Africa never looked comfortable, a trend for the majority of the four-test series. India were not without their worries, but it was the better handling of the conditions that made South Africa look inferior at the best of times. Anil Kumble summed it up in one line during the first test by saying “if you’re a spinner, what more do you want,” referring to the cracks in the surface. Without a doubt South Africa were outplayed. The reactions from those watching seemed to take to the “blockathon” positively. Amla also defended the tactics in the fourth test. “Nobody wants to block everything but the need of the time was for us to try and bat as long as we can and take as many risky shots out of the equation,” Amla said. Infinity Cricket founder Navneet Ganesh said it was what was implemented standing at the crease that let South Africa down. “I feel shot selection with the bat let them down and the dogged determination was missing prior to this test,” he said. With such a series has come criticism of the pitches, but Ganesh said what was seen on the sub-continent is a true testament to the longest form of the game. “Test cricket is not meant to be easy and I think the beauty of it is that pitches vary in different parts of the world,” he said. The Proteas go home with their tails between their legs. India have returned home jubilant.